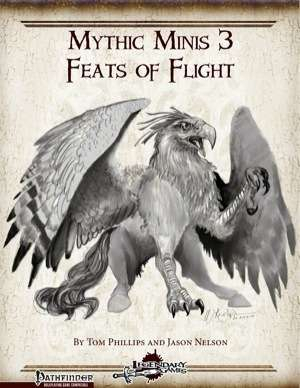 The third in our new series of Mythic Minis brings you 8 mythic feats for your mythic monsters, including mythic versions of existing feats like Flyby Attack and Wingover as well as brand-new mythic feats like Devastating Flyby and Stratospheric Soarer. Mythic Minis are short, inexpensive products designed to take one rules concept or set of Pathfinder RPG rules and bring them to you in a new way for the mythic rules, including converting existing rules as well as introducing entirely new rule options. Created by the same designers that helped bring you the official mythic rules, Mythic Minis skip the fluff and give you all crunch, all the time. Nobody knows mythic like Legendary Games, and whether it's new mythic feats, class abilities, path abilities, magic items, or anything else, every Mythic Mini delivers a delicious dollop of dazzling design that will fill out your mythic experience one slice at a time. Check for a new Mythic Mini every Monday to make your game just a little more Legendary!